This spectacular, two-part model realistically depicts a landscape with karst features. The top portion can be removed to expose an entire subsurface cavern with stalactites, stalagmites, festoons, and an underground lake. 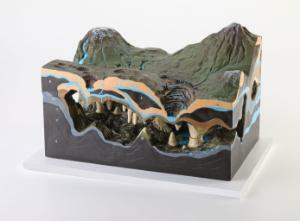 The hand-painted, intricate resin model is securely mounted on a wooden base.